Golf is a sport that is turning out to be extremely productive from Sri Lanka’s point of view. Over the past five years or so, it has produced professionals on an annual basis, promising to match cricket as a lucrative sport. 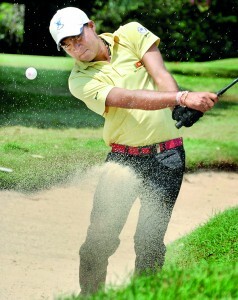 Vijitha Bandara from Digana, Kandy- the top amateur golfer in Sri Lanka-has clearly indicated his intentions of becoming a pro, after N. Thangaraja, Zen Dharmaratne, K. Prabagaran, Mithun Perera, Tissa Dharmasena and Anura Rohana reached the pro-circuit. Bandara, whose name depicts where he comes from, won his first major title internationally last week by clinching the Gannon Dunkerley eighth NCR Cup, held at the Delhi Golf Club in India. “I was so excited to show the trophy to the defending champion, N. Thangaraja, back in Sri Lanka from the moment I won it. The pressure, which was built on me throughout the competition, helped me in choosing the right clubs at the right place. It gives me great satisfaction to be among the top golfers in the region and to have won it. At the back of my mind, I have humble pride in myself in growing from what I was a decade ago,” Bandara stated. Eleven years back, although Bandara was not a stranger to golf he did not possess that instinct needed to pursue any sport as a career. His father, Kiribanda, being a green keeper at the Victoria Country and Golf Resort in Digana, Kandy, paved the way to building Bandara’s fascination for golf. Today after spending hours on a sport he had very little vision about, Sri Lanka’s 25-year-old top amateur golfer is counting down the days until he becomes a professional. “With my father being a green keeper at the most picturesque golf course in Sri Lanka I had a glimmer of hope of becoming a golfer. But it was my schoolmate, Gamini, who tempted me to take up the sport when I was barely fourteen. “I attended a primary school in Digana and moved to Thengalle Central but studied only up to the O’Levels. But I was a keen athlete who used to represent my school at cricket, volleyball and high jump. Then in 2003 I left school and joined the Victoria Golf club as a helper before starting to play golf full time. It was then that began to feel golf had a bright future,” Bandara explained. In 2005 Bandara toured India to take part in a junior tournament. By 2006, he rapidly improved and was playing amateur tournaments that helped him enter the national team. In no time at all Bandara found himself among the top ten amateurs in Sri Lanka, a list which then included the likes of top golfers such as Tissa Dharmadasa, Mithun Perera, K. Prabagaran and N. Thangaraja. Bandara thinks playing cricket at school has helped his golf career at least in a small way. When he was initially in the competitive field, Bandara was playing 28 handicap and it took him nine long years to reach the handicap zero level. By this time Bandara was an expert in controlling shots as well as the ball. “All the top amateurs became professionals and it gave me the opportunity to become the top amateur golfer in the country. But the path towards success was not an easy one. I practiced hard and focused seriously on what I did. Moreover golf is not a hard sport to engage in as everyone thinks. Prior to his first major international title last week, Bandara played in the All-India Golf Open tournament last year and went all the way to the quarterfinal stage. In 2005, Bandara won tournaments at all three courses in Sri Lanka- Digana, Nuwara Eliya and the Royal Colombo in Colombo-on his way to winning his maiden international title after nearly eight years. “Thangaraja, who won this title last year, and I have a great relationship in golf. I was proud to claim it after having been unable to win the Sri Lanka Open last year where I hit a record of 14 shots in two days. I led by seven shots on the final day but lost by one shot to Anura Rohana eventually. I will never forget that day and it gave me more strength to look for wins. I would like to show this trophy to Thanga – and tell him ‘if you can I can too,” claimed Bandara, who hopes to expand his golf empire at the PGA in India, the Asian Tour and the European Tour before turning into a teaching professional in golf.